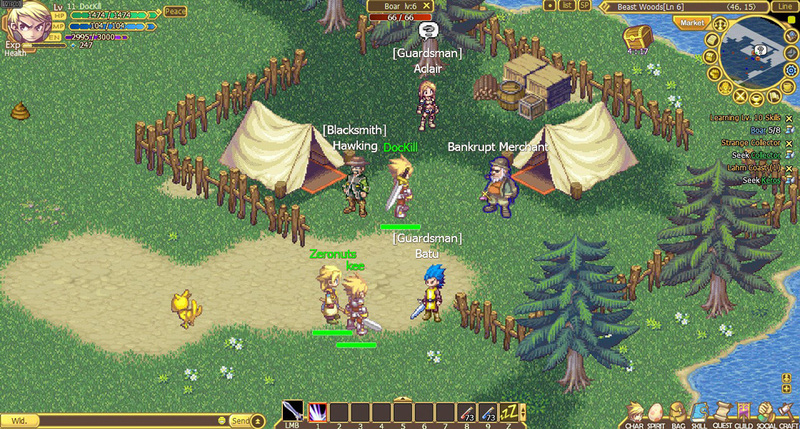 Serenia Fantasy is a free to play browser based 2D MMORPG which incorporates highly detailed Pixel art and animations in order to create a fairly retro visual experience. Fans of classic 16 bit RPGs will certainly enjoy the visual nod as well as some of the game mechanics as well. In Serenia Fantasy players can collect a variety of costumes, each with their own unique style and stats. These costumes even give players the ability to cosplay as more iconic cartoon and video game characters. 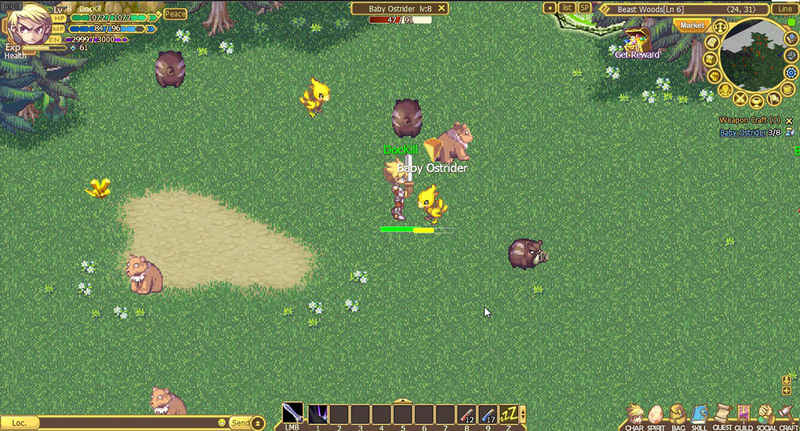 The game features an interesting pet transform mechanic which allows a player to turn into almost any monster they have defeated. This includes boss monsters and the skill also unlocks additional abilities and stats for the player during the transformation. 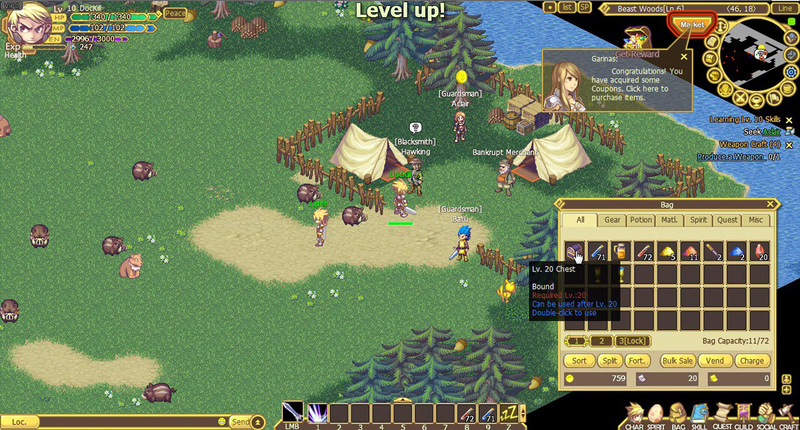 Unlike most MMORPGS, Serenia Fantasy features several game modes which break up the style of gameplay beyond the typical PvE. Players can participate in modes with names like the Masquerade, Werewolf Hunting, the Bonfire Gold Filling, Soul Collecting and Corpse Pulling. Certainly modes not usually found in other MMORPGS (at least not by those names). If u guys wanna play this game..click login and then pick u5 prairie server…its still online even not so much players..but the world chat isnt silent…good for returning player.. I had a feeling this would be a good MMORPG, but when I clicked Play Now, it just took me to the website. Registered, logged in, then clicked around helplessly until I clicked Home. Clicking Start on that next page just takes you to THE EXACT SAME PAGE. Clicking Register just didn’t work at all for me, which I did out of desperation. In summary, this game is all but impossible since I haven’t even beaten the s*** that comes BEFORE the game ever starts. I had a feeling this would be a good MMORPG, but when I clicked Play Now, it just took me to the website. Registered, logged in, then clicked around helplessly until I clicked Home. Clicking Start on that next page just takes you to THE EXACT SAME PAGE. Clicking Register just didn’t work at all for me, which I did out of desperation. In summary, this game is all but impossible sine I haven’t even beaten the s*** that comes BEFORE the game ever starts. This classical-themed and real-time game tend more awesomely than the other MMORPGs, because of its rather old graphics has remind us about the classical age of MMORPGs a few years ago. Even though some parts of the game mostly still insufficient, SF would be the one of amazing MMORPG games that are always making any players interested. I hope every bugs and glitches and errors and so on would be fixed as soon as possible, so we should have no problems when we enjoy the game. Speaking from experience in both servers, 1 in koramgame 1 in gamedp, I can only say that even if there are quite a lot of free events, but honestly some of them are very tedious to complete or time-consuming. Like for example the “collect how many natural ingredients” quests. The problem with SF is simple… way too much focus on Pay 2 Win system. Daily, weekly missions and talent challenges need even very decent eq to survive, let alone kill. What’s more, the main problem is the pk mode. There’s a daily mission that requires one to turn on pk mode for 3 hrs, which at high levels when some are bored there would be mass pk spree, except guildmates. Also, some higher level events are always pvp whether you turn on pk mode or not. Therefore some bullying will arise, and gms will turn a blind eye to the merciless stalking and killing in an AFK game. Well overall, it’s still fun since it reminds me a lot of FF and there is the auto loot and auto fight system, I’ve thought about returning to SF a few times, but a word of caution: Try not to join an established server. Cause if you did not undergo free events it is likely your character will be behind others in power by a lot. And that means in higher level you can either suffer (die and unable to kill) in PvE or PvP a lot. I do not need to win on order to play a game. This game started out great about a year or so ago. The content was spectacular, but then issues began to arise. Frequent black screens, freezing loading screens, bad connections, etc … the list goes on. It’s still an issue the game faces today. Cash shop items very in prices, but the amount of any particular character boost item increases exponentially per level up. To change the appearance of your character, players must buy outfits, which come in 7 day & 30 day. Each have the same bonuses for the most part, but different pricing; even among the 7 day group & the 30 day group. Items are given out weekly to keep players, and weekend events offer players rewards for adding tokens. They are broken into several tiers which reward according to the amount of tokens you add. Hair can be modified through ingame items. Color & style are changeable but the required items must be found then crafted into the mod item. Weapons, armor, & other equips can be forged then modified depending upon crafting level. The more a character forges equips, the higher level they will eventually become. Equips can also be upgraded through cash shop items, to increase their attack and add other bonuses, as well dropped items from simple field monsters to overwhelming bosses. Training can be done manually or be left on auto-pilot. During the course of play, the HP & MP bar will continually be refilled courtesy of having your excess HP / MP pool full (Life Sources & Magic Sources.) Players are given coupons during the first 60 levels or so to buy some coupon shop items, among which the Sources can be found. For beginning players, there are TONS of quests to be completed, but eventually degenerate into a monotonous series of the same quests over & over unless leveling up becomes something daily. Skills & talents can be added as the game progresses. Skills are gained killing monsters & using magipoint items to pay for those skills. Unfortunately, after Lv 3, those skills have to be paid for with magipoints AND skill gems, which get ridiculously expensive despite minor bonuses. Skills are broken into three trees per class & are paid for with talent points, obtained through quests & daily challenges. Level cap on talent is 105; each talent in the tree varying from master Lv 1 to master Lv 20. PvP is available, but the system apparently uses ranking so it’s not uncommon for low level players to be matched with someone insanely powerful in comparison. Challenge events exist pitting guild against guild & player against player in groups, but these occasionally get mismatched, especially for players of Lv 8x being thrown into groups of Lv 100+ and pretty much stomped or cornered for spawn killing. The development team left loopholes open allowing for people to abuse glitches. Eventually players developed hacks for the game. Despite the community’s outcry of foul play, the mods were mostly impotent, if not incompetent. Overwhelming amounts of evidence was presented yet ignored. It even resulted in one of the mods being demoted. There are no ingame mods, they’re all forum mods so players can get away with just about anything in the game; including bullying & endless harassment of other players. Months after the initial case of glitch abusers was presented, the accused players still play freely & without concern of being suspended banned. It has moved on to entire groups of players actively abusing the system without fear of reprisal. One thing of note in the game, the mods are all just regular players in the game so any outcry in the forums means a guarantee for the issue to be swept under the rug. To top things off, the dev team pays little attention to player suggestions. Many many suggestions were made since the players got involved to attempt making the game better. Almost ALL of the suggestions were ignored while the players were given the most inane excuses as to WHY the suggestions were too troublesome to implement. Overall a good game to relax with & play from time to time. If you don’t mind a bear market & game dominated by people abusing the system & getting away with it, then this game is for you. Overall a 4 out of 10. Amen to this, I also came from there, this company (KORAMGAME) defend cash player that abusing bugs, some high cash user over there already end up supporting this company after KORAMGAME defend the cheater, also I end up buying token(cash) after I know how corrupted this company. Koramgame doesn’t know how to threat their customer well. You think the mods are going to do anything? Have you stopped to consider that the mods are just regular players in the game? Their power is only in the forum where they can silence anyone’s outcry about foul play, hackers & glitchers. It would not surprise me if the mods are being bribed into not doing anything & remaining silent in passing along the information to the dev team though they’ve proven they are too busy with token markets & events to do anything about issues the game is facing. Ho to get CD key for this game?? The game i so fun and it has a nice feel to it.